A simple list of the Injustice 2 roster, including DLC characters and Premier Skins. From action to horror, fans admire Netflix's original content. But imagine if some of those great television shows became video games. It’s a bird! No, it’s a plane! No, it’s…. Who? Find out why these five superheroes should have their own game. You may not have heard of these baddies, but they're still diabolical -- and would make great additions to Injustice 2. You've never heard of them, but they're more than worthy to stand among the greats. NetherRealms Studio continues their Rebirth Series with a new version of Raven for Christmas -- and a challenge mode that ends sooner rather than later! NetherRealms' new update allows players to promote mastered characters to become even more powerful! Instead of fighting the Black Friday crowds, fight DC heroes and villains in an updated challenge. Just in time for the 2.12 update of Injustice, NetherRealms brings back a Justice League favorite. The Justice League's resident Martian returns in frightening form, just in time for Halloween. The new update sees Harley Quinn, The Joker, & Deadshot added to the mobile game to tie-in with the Suicide Squad movie release this week. Everybody get ready to put your capes and supersuits on because Injustice 2 has been announced. Injustice 2 is all but confirmed, thanks to a "helpful tipster" and a hilarious tweet from Ed Boon. Now you can finally realize your dream of owning a Batphone, marked with the logo of a three-year-old game. Batman is everywhere! The Caped Crusader has had a ton of games, not least of all the new Arkham Knight. But what are his best gaming outings? Let's find out! 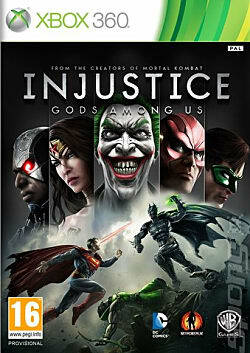 Heroes Assemble -- Injustice 2 CONFIRMED! Samsung Releases Injustice Batman-Themed Phone To Celebrate...Something?